From around 2011 the site became a focus of interest for several local groups, with an amateur archeological dig to unearth the industrial history of the site back to its roots in Victorian times by The Friends of Norwich City Station (FONCS), who were on site and held open days to view the findings for over a year. The site also became a focus of activity for Norwich Green Gym, who made a serious attempt to maintain the area, including lopping, clearing and opening up a pond that was becoming weeded up. Norwich City Council had assumed responsibility for the land, believing that they owned it. However, after some confusion, it was found to belong to Norfolk County Council. Soil tests were carried out and some contamination from its railway days was found on site and work was then undertaken by the county council to clean up the area. Unfortunately, the local wildlife and train heritage groups were prevented by the council from doing the voluntary management they had been enthusiastically undertaking. Then matters took a turn for the worse. Cabinet member for resources, Cllr Cliff Jordan, agreed to the land being put up for sale at auction as it was ‘surplus to requirements’. A petition was raised objecting to the sale of the public land. This achieved nearly 2,000 signatures within a matter of weeks, and was handed in at both City Hall and County Hall in April 2013. Friends of Train Wood and Marriott’s Way was formed to campaign to ensure that the wood stayed in public hands. The wood was abruptly withdrawn from sale just days before the auction was due to take place. 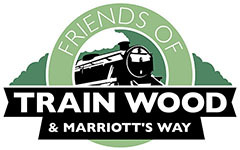 Friends of Train Wood and Marriott’s Way then went on to campaign through local elected members, legal representations and many meetings to ensure that the site was kept in public hands, as although it had been withdrawn from the auction it remained on the disposal list. The group listed the site as an Asset of Community Value (ACV) – the first green space to be listed as such in the city and only the second ACV at that point. Several meetings with Norwich City Council to ask them to take it on, as it is a key city wildlife and amenity site, proved fruitless. Legal representation was retained, with Mills and Reeve Solicitors acting for free for the group, to examine the possibility of taking on a long lease of the site. However eventually, following a meeting, Norfolk County Council member David Harrison agreed to take it off the disposal list.